Our eye doctors in Raleigh conduct comprehensive eye exams to assess your overall vision and screen for the presence of eye diseases such as glaucoma and cataracts. We also offer our patients treatment for a variety of conditions (like dry eye syndrome, macular degeneration, astigmatism, farsightedness and diabetic retinopathy) as well as eye infections (pink eye, styes, blepharitis, etc.) in efforts to provide you long-term vision protection. Dr. Jeffrey Handschumacher serves as the primary optometrist at Family Eyecare Center. A firm believer in the big picture approach to eye care health and maintenance, Dr. Handschumacher not only takes time to carefully examine you, but also conducts a thorough investigation of your vision history in efforts to better provide for your eye care needs in the future. 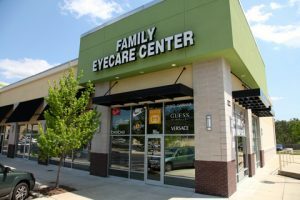 With an office located in Raleigh, Family Eyecare Center offers premier eye care services to people in surrounding areas of Eastern North Carolina. From Astigmatism to Keratoconus detection and treatment, eye exams and contact lens fittings, we are sure to have the full range of family eye care and medical solutions you’re looking for. Contact us today to schedule an exam or lens fitting at our practices and find out for yourself what makes us Eastern North Carolina’s choice for their every eye care need! We also make it possible for you to schedule an appointment online for our Raleigh eye care clinic! Call us at (919) 981-4444 or schedule an appointment online. Do you suffer from dizziness and headaches?